The National Society of Health Coaches (NSHC)®, the health coaching division of Miller & Huffman Outcome Architects, LLC, was founded in 2007 on the premise that healthcare professionals could positively impact health behaviors and patient/client "compliance" by altering the traditional patient engagement approach through evidence-based conversation. NSHC’s Lead Coaches found within their own clinical practices that patients responded more positively when engaged in a partnering fashion, where the patient's agenda/concerns/fears guided the engagement conversation, as opposed to the traditional approach of "do as I instruct, or prescribe you to do." 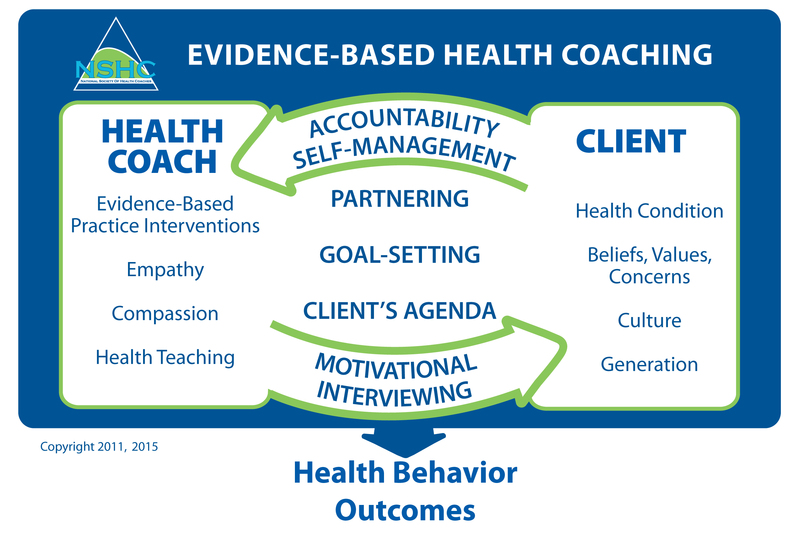 Miller & Huffman write and speak professionally across the U.S. about Evidence-based Health Coaching (EBHC)® utilizing motivational interviewing (MI) as its foundation, and offer full-day CoachClinics® to groups and organizations to provide personal instruction and practice in the application of this engagement approach. Motivational interviewing has well over 300 studies demonstrating its effectiveness in guiding behavior change in a variety of healthcare and wellness settings. With its membership 4700+ and growing daily, the NSHC believes that Evidence-based Health Coaching (EBHC)® with Motivational Interviewing (MI) has changed the landscape of the patient-provider relationship and will play a major role for years to come in health management, patient engagement, treatment, and wellness and prevention. The Society's founders are asked regularly to participate in many corporate, State and Federal agency advisory boards, committees, consortiums, including TN Congresswoman Diane Black's Healthcare Advisory Committee, Centers for Medicare/Medicaid Services (CMS) Patient Family Engagement (PFE) Affinity Group, Medicare Quality Improvement Organizations: Quality Insights of PA and QSource of TN and HHQI's Technical Expert Panel of the West Virginia Medical Institute. A principal of Miller & Huffman Outcome Architects, LLC and Co-founder of the National Society of Health Coaches, Melinda is a Certified Health Coach and Health Coaching Consultant for integrating evidence-based health coaching and outcomes into clinical practice and the workplace. She's a best-selling author, writer, educator, and nationally known speaker. Director of Disease Management for Amedisys, Inc., Asst. Patient Care Administrator for Southern TN Medical Center; Director of Nursing Education, Motlow College in Lynchburg, TN. Disease Management: Gold Nuggets to Success! Best Seller: Implementing Outcome-Based Homecare: A Workbook of OBQI, Care Pathways, Disease Management, Home Health Outcomes & Pay for Performance. She's a member of the QIO National Technical Expert Panel and contributor to Quality Insights Care Transitions Best Practice Intervention Packages. She writes for nationally known peer-reviewed journals, newsletters, guest blogs, and magazines on evidence-based health coaching, patient engagement, evidence-based practice for chronic condition management and healthcare outcomes. A Principal & Co-founder of Miller & Huffman Outcome Architects, LLC and the National Society of Health Coaches (NSHC). Tenured healthcare executive, author, speaker, and Certified Small Business Consultant. 25+ years creating and executing outcome-based clinical models and operational processes, evidence-based disease management programs, clinical software and integrated IT strategies, as well as identifying industry stakeholders and cultivating value-added relationships across the healthcare spectrum to meet complex clinical and financial outcome goals. Senior Vice President of Clinical Services, Regulatory Compliance & Disease Management - Amedisys, Inc.; Director of Disease Management - Columbia Homecare; Director of The Diabetes Center for Excellence and Adult Critical Care - Columbia Hospital System. Evidence-based Health Coaching for Healthcare Providers, 3rd. Ed. ; Evidence-based Interventions & Decision Support for the Management of Chronic Conditions in OASIS-C; BluePrints for Chronic Condition Prevention & Management; ICD-9-CM Coding Quick Reference for Home Health Clinicians and Managers 1st and 2nd Editions; Evidence-based Health Management & Prevention Teaching Booklets for clinicians and consumers. Contributing author of Implementing Outcome-Based Home Care; a Workbook of OBQI, Care Pathways, and Disease Management. Researcher/Developer of the Teletriage Symptom Reference contained in the Centers for Medicare/Medicaid Services (CMS) Quality Insights Home Health Telehealth Reference. Graduate of the University of Toledo and Covenant College with degrees in Nursing and Business.